I am genuinely thankful for the YouVersion Bible App. It took me quite awhile, but I finally downloaded this thing a couple of years ago, not long after Dad died. It’s free, and it’s been my most-used app. Right up there with Facebook and Twitter, which is saying something. My favorite feature of this app is the plethora of Bible reading plans it offers. Everything from classic devotionals, to Bible-in-a-year variations, to short and sweet 1-2 week series are available. Not only that, but it offers (I’m pretty sure) every English translation of the Bible there is. The Word of God, complete and unabridged. And commentaries! So many classic commentaries. It’s kind of ridiculous how much is in this app. As in no cost. None monies. Zero dollars. Pro bono. The way the Word of God should be, in an ideal world. When it’s impractical or impossible to pack my actual, physical, leather-bound Thompson Chain Reference Bible, it doesn’t matter, because I have 8 bajillion versions of the entire Bible that fit in my pocket. In. My. Pocket. This means that I don’t have to skip out on my quiet time in God’s Word, ever. What about WiFi, you ask? What if I don’t have a connection? Well. Get this. 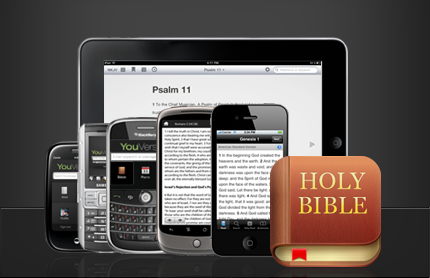 You can download offline versions of the Bible, too, so that you can still access it and search the Bible without a data connection. 30 Days of Thanksgiving, days 10 & 11: Because, stomach virus. The day he deployed, saying ‘bye to Little Red. Look at those chubby cheeks! Day 10: I am thankful that the stomach virus that swept nonchalantly through our home was short-lived. Miserable, but short-lived. I am also thankful for good general health among the six of us, so our immune systems could handle the vomit carnage. I’m exaggerating, of course. Durin was the only one who barfed more than twice during his battle with the bug. Still, even he was only down for one day. So, I will be diffusing Thieves oil, airing out the house in spite of the chill, and cleaning doorknobs with grapefruit seed extract and whatnot to make sure this bug stays dead. Day 11: Today I am thankful for my veteran husband, Levi, who served eight years in the Air Force, and was deployed once during that time. Without him, and other men and women in uniform, this country might be a sorrier place. Thank you so much for sticking around and putting up with these weird, disjointed posts. Y’all are so understanding. And in the meantime, won’t you please visit CAPPA’s YouTube channel, and consider subscribing? This is the channel I am running for CAPPA, and would dearly love to get the video messages out to a wider community! Thank you so very much! Posted in 30 Days of Thanksgiving, Just Me, Life at the Inn | Comments Off on 30 Days of Thanksgiving, days 10 & 11: Because, stomach virus. Our very first butterfly kit. Today, though I am behind, I just want to take this chance to express gratitude for my four children. Day 5: I am thankful for my firstborn, because it is he who made me a mother for the first time. It is he who has had to endure the first and worst of my parenting mistakes. It is he who will always be the guinea pig of the family. It is he who is teaching me so much, though I feel like I am having trouble learning what I am supposed to learn. On the verge of young manhood, I am perplexed and nervous about the next phase in his life. I have made so many mistakes already, and I fear the worst are to come. So, I thank God for this gift of a firstborn son, who loves me, and who still needs me to be the best mother I can be, and who forgives me so readily when I ask him. I am grateful for his affectionate, loving nature, and I pray I can nurture that part of him over the next few years, and help shape him into a loving and gentle man. Day 6: I am thankful for my firstborn daughter, who has shown so much self-discipline lately. I am certain (because I asked her) that it stems from the trouble she sees her siblings getting into, and she wants a different path for herself. Still, little does she know that this self-discipline is exactly the quality she will need to achieve whatever God sets before her in life. So, I am thankful for this characteristic in her. She is so much better than I was at her age. I am thankful that she is a bit of a mystery to me, and that I have to work to bring her heart to the surface, where I can know her better. I am thankful that I must open my eyes and ears more purposefully with her, otherwise I would miss who she is. Day 7: I am thankful for my redheaded third-born. High-strung and sensitive, this one is a great challenge to me as well. It seems that she will not capitulate to anything without first fighting it out in some form or fashion. She is quick to anger, but quick to repentance and grace as well. She has high highs, and her lows plunge her into the “depths of despair,” much like my own personal Anne Shirley. She is a puzzle, longing for more freedom than she is ready for. She is the one teaching me patience and grace. To be quick to listen, slow to speak, and slow to become angry. I am thankful for her refining personality, and the strength I can see growing in her, that will allow her to stand firm among giants, in spite of her small stature. Day 8: I am thankful for my youngest, of the long lashes, brown eyes, and freckled little-boy face. That child has taught me, more than any of them, that not all children are the same. Teaching him to read has been one of my biggest parenting challenges, but I managed it. His brain just works so very differently than any of the others, that I marvel. Sometimes, I wonder if I am really the right mother for him, but he helps me to remember that God chose me specifically for him. There can be no better mother for this child, in spite of appearances. He has taught me to trust that God makes no mistakes in the paths he sets before his children, and that I can, indeed, do “all things” through Christ who strengthens me. Day 9: I am thankful that the virus going through our house the past few days is very short-lived, so that we can each just move on. I am thankful that Saturday was incredibly productive for me, so that I could take a true day of rest on Sunday, though it meant taking a rain-check on a much-needed outing with one of my dearest friends. Perfect timing, stomach bug. Perfect. (Note: there really should be a sarcasm font…) This illness running through the house is teaching me to be thankful in everything. It also taught me not to let these things derail me quite so much as they used to. To instead just roll with it, and be grateful for strong immune systems. Pardon any typos, I don’t have time to proofread this morning, as I do need to get started on our homeschool day, like, two hours ago…but I couldn’t let the morning pass without acknowledging the goodness of God. Several of us in the Preparing for Birth office space are grateful for the gorgeous Indian-summer sunshine we have experienced in the past week! The weather has been truly delightful, with blue skies, incredible cloud formations, perfect temperatures, and just the right amount of crisp in the air to justify boots and hoodies. The vivid yellows that characterize fall leaves in Colorado (thank you, high altitude and aspens) are an added source of light, and bathe us in sunny hues even on the days that bring some overcast skies. Jennifer Green and Ramona Webb have both expressed their gratitude for the sunny weather we’ve had, and the colorful leaves presiding in radiant glory over our parks and lawns and gardens all across the city. Their thankfulness has reminded each one of us that, no matter the season, there is always beauty to be had. Our steps have been lighter, our hearts more ready to receive the message of surrender that autumn brings us. We all anticipate this winter to be especially cold, with a lot of heavy snowfall. Who knows, really? So, enjoying the dying days of autumn help all of us to slow down, breathe in the scent of earth and wind and leaves, and let go. Even Desirre, who detests the parting of summer, has been inspired to find hope in the falling leaves. In our hearts, though we know that autumn is but a preparation for the death of frost and winter, we also know that Spring will surely come. That resurrection is the rule, not the exception on God’s green earth. And that is truly something to be grateful for. What do you like best about autumn? What are you thankful for today?